With the exception of the Metrology FREEWARE User Group, which is free to join, this area is reserved for licensed users of one or more of the many open-math VBA/Excel based metrology software products from Quametec. If you are a licensed user of one of the listed products, contact Quametec (M-F EST 9 am-4 pm) at 1-810-225-8588 or send an email to info@quametec.com to get your FREE "enrollment key". Membership is FREE to licensed users of the Quametec software products supported here. Enroll into this User Group to access numerous FREEWARE metrology software and spreadsheet tools that you can download and use. This freeware even comes with FREE support provided courtesy of QIMT and the "Metrology Freeware Development Committee". As a member of this user group, you can participate in the help forums and other activities, such as initiate requests for other tools and provide ideas of improvement for current tools. And of course, you can download FREEWARE for FREE! Download and/or use of Quametec™ FREEWARE implies agreement to abide with the Quametec™ FREEWARE End User License Agreement! We have had many requests for a FREEWARE uncertainty calculator for those who do not need the full power of UncertaintyToolbox™. We have also had requests for a "Range Uncertainty Statement" calculator. We are proud to announce the release of the "U95-RangeEstimator™" for Microsoft® Excel® as a FREEWARE software product. This tool uses Quametec's unique Measurement Uncertainty Range Estimation Method allowing for efficient estimation of uncertainties across a range of measurement rather than the traditional "Single Point" uncertainty calculator. Meaning, this tool provides Range Uncertainty Estimates based on the uncertainty at the top and bottom of a given range of measure along with the traditional single measurement value uncertainty estimate! This FREE tool is available NOW for download within this User Group. This User Group is FREE to JOIN! If you like the idea of metrology freeware tools and would like to see more made available, please consider joining our "Metrology Freeware Development Committee". You can have an active voice on the selection of projects for the group and even learn a little VBA and some Excel tips while you help us create more FREEWARE! We need volunteers who are familiar with metrology tasks and can assist in writing user manuals, procedures, or in helping develop the software tool. The default development tools involved are Microsoft Excel, Word, and VBA. This is guaranteed to be worthwhile learning experience for the participants and beneficial to the whole metrology community. If you or your company has any useful spreadsheet tools for use in metrology that you wish to share as freeware, QIMT would be happy to review and possibly even improve upon it, with your permission, and release it with reference to you or your company as the contributor. And best of all, we provide FREE support on all the freeware tools available in the User Group. More information is available in the user group area. If you are a licensed user of any version of Uncertainty Toolbox™,you can join this User Group. It is FREE to all Licensed Users! Call Quametec at 1-810-225-8588 or email info@quametec.com to get your "enrollment key". Download the current and/or older version of UncertaintyToolbox™ (requires license code for selected version to install). Get an automatic notification emailed to you when new versions are released. Interact with other users of the software. This is the Software User Group for those using "CAPA+™ for ISO17025". 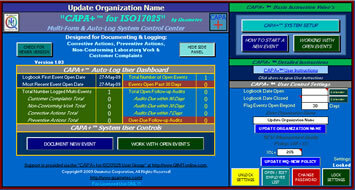 CAPA+ is a Micosoft® Excel® based Auto-logging laboratory problem event handling system. It consists of a Control Panel, an auto-expanding unique copyrighted Multi-Form, and an Auto-Logbook. It includes a complete Microsoft® Word® format, editable ISO/IEC17025 user procedure for documenting Complaints, Corrective Actions, Preventive Actions, and Non-Conforming Laboratory Work Investigations. For More information, go to the Quametec Software Section.